I have very little weeds in my garden, but I do have a lot of grass that is taking over my garden. 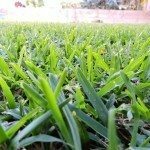 How can I kill the grass without harming my vegetable plants? Many people like to use weed barrier cloth in their garden to keep the weeds down. If that is not appealing, mulching around your plants will also keep the weeds down.